You may submit your History GeoTrail Part 2 geocaching finds! Geocaching is a real-world outdoor treasure hunting game. Players try to locate hidden containers, called geocaches, using GPS-enabled devices and then share their experiences online. 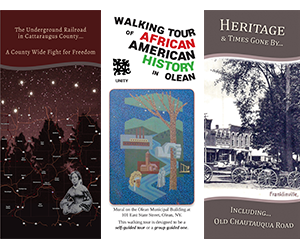 The Enchanted Mountains History GeoTrail Part 2 (EMHGT2) has been developed by the Cattaraugus County Historical Advisory Committee, along with Cattaraugus County's Dept. of Economic Development, Planning and Tourism. It is hoped that by exploring historical sites (some well known, some not known), and reading some of the sentences pertaining to the history of the location, that a spark will be ignited for people to explore our past and perhaps join one of our Historical Societies. The EMHGT Part 2 has an additional 14 geocaches with 14 corresponding magnetic buttons and a new trackable geocoin for finding 12 of the 14 geocaches. Successful collection of 12 caches will entitle the cacher to a special commemorative Enchanted Mountains History Geocoin for Part 2. Look for the four sentences along with the keyword for interesting facts about the location the cache is hidden. You can request an Enchanted Mountains History Geotrail (EMHGT) rack card for Part 2 (different than Part 1) with cache names and places to write your keywords down. All geocaches are ready to be found! EMHGT2 geocaches are currently available on Geocaching.com. You may submit your EM History GeoTrail 2 geocaching finds! All geocaches are officially registered with geocaching.com. Watch a video about how to geocache. Register on geocaching.com. Participants will need to be registered on geocaching.com to retrieve the coordinates and other location information. Registering on geocaching.com is free. Check out the listing of EMHGT2 caches on Geocaching.com! Get your EMHGT 2 Rack Card to record your geocache finds. Be sure to bring a GPS unit and a camera. Each cache will have a unique keyword written on the inside of the cache container’s lid. Additionally there are four sentences pertaining to the history of the site. These are not required to be written down, only the keyword is needed. Write this keyword down next to the location name in the leaflet. You will then either mail the list of locations and keywords to Enchanted Mountains, 303 Court Street, Little Valley, NY 14755 OR simply fill out the on-line form with your latest cache(s) at HistoricPath.com/form/submit-your-history-geotrail-part-2-finds and we’ll send you your Cattaraugus County History Geotrail Button(s). You may also stop in to the Tourism office at the County Building during business hours to obtain your buttons. Looking for Parts 1 or 3? EMHGT Part 1 can be found here! EMHGT Part 3 can be found here!